By Amanda Liverzani – Edited by Insue Kim [caption id="attachment_3080" align="alignleft" width="150"] Photo By: TexasGOPVote.com - CC BY 2.0[/caption] Alice Corp. Pty. Ltd. v. CLS Bank Int’l et al., No. 13-298 (783 U.S. ____ June 19, 2014) Slip Opinion Intellectual property practitioners and technology companies anxiously awaiting clarification on the patentability of software will find little guidance in the Supreme Court’s recent decision in Alice. In the highly anticipated decision, the Court declined to articulate a definitive test for when software may be patented, instead relying on the precedent established in Mayo Collaborative Services v. Prometheus Laboratories Inc., 566 U.S. ____ (2012) and Bilski v. Kappos, 561 U.S. 593 (2010) to invalidate the software patents at issue. The dispute involved four patents held by Alice Corporation (“Alice”) related to a computer-implemented method for reducing “settlement risk” in financial transactions (U.S. Patent #5,970,479, #6,912,510, #7,149,720, and #7,725,375). Alice, slip op. at 1. CLS Bank, operator of a global currency transaction network, brought suit in the District Court for the District of Columbia, arguing that Alice’s patent claims were invalid and unenforceable. Id. at 3. Following Bilski, the District Court held that the claims were ineligible for patent protection because they were drawn to a patent-ineligible abstract idea. Id. at 3–4. On appeal, the Federal Circuit sitting en banc affirmed the District Court’s decision. Alice filed for certiorari. Id. at 4–5. 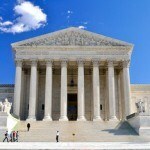 The question before the Supreme Court was whether Alice’s claims were patentable under §101 of the U.S. Patent Act, or whether they were directed to a patent-ineligible abstract idea. Id. at 1. The Court unanimously affirmed the Federal Circuit’s decision, holding that Alice’s claims were directed to an abstract idea and contained no inventive concept, thereby rendering them patent-ineligible. 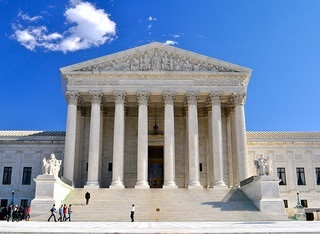 Justice Thomas began the opinion of the Court by reviewing the scope of subject matter eligible for patent protection. The Patent Act's §101 provides that: “Whoever invents or discovers any new and useful process, machine, manufacture, or composition of matter, or any new and useful improvement thereof, may obtain a patent thereof, subject to the conditions and requirements of this title.” 35 U.S.C. §101. To prevent the preemption of concepts fundamental to scientific and technological progress, courts recognize an exception to §101 for laws of nature, natural phenomena, and abstract ideas. When applying this exception, courts look to differentiate between patents that merely claim the “building blocks” of human ingenuity and those that transform the building blocks into something more. Alice, slip op. at 6. When distinguishing between these categories, courts use the two-step framework from Mayo. Id. at 7. The Mayo framework first requires the court to ask if the claims are directed to a subject ineligible for patent protection. If the answer is affirmative, the court then considers whether the claims add additional elements that are transformative of the ineligible concept. Id. Relying on its recent decision in Bilski, the Court concluded that Alice’s claims were directed to an abstract idea. Id. at 8–10. In Bilski, the Court held that a method for hedging against financial risk was ineligible for patent protection because the concept of hedging is a patent-ineligible abstract idea. Comparing Alice’s claims to those in Bilski, the Court reasoned that there was “no meaningful distinction between the concept of risk hedging in Bilkski and the concept of intermediated settlement at issue here,” finding both were “squarely within the real of ‘abstract idea.’” Id. at 10. Next the Court considered whether Alice’s claims added additional elements which transformed the abstract idea into a patentable invention. Alice argued that the use of a computer system to implement the abstract idea of intermediated settlement constituted a transformative element sufficient to render its claims patentable. The Court rejected this argument, finding that “the mere recitation of a generic computer cannot transform a patent-ineligible abstract idea into a patent-eligible invention,” id. at 13, and that the computer components of Alice’s claims merely recited the concept of intermediated settlement as implemented by a generic computer, id. at 14–15. Ultimately, the Court held that Alice’s patents were invalid because they fell under the abstract idea exception to patent-eligibility under §101. Though the Court invalidated the specific software patent at issue, it declined to clarify the boundaries of the abstract idea exception in relation to software patents in general, noting that it “need not labor to delimit the precise contours of the ‘abstract ideas’ category in this case.” Id. at 10. Thus, followers of the software patent debate must await further guidance in this heated area of IP law. For additional discussion, commentary on the Alice decision is available at Patently-O, The Register, Washington Post, and SCOTUS Blog.